The library feed features stories, profiles and news about our community. Alex Thomas is a graduate (Congrats Class of 2016!) of the History Department. Over the past 3 years Alex worked as a Student Assistant in Special Collections and Archives. For his final project, we asked him to recap his senior project research, which uncovers the historical landscape of Cal Poly. You can read more of Alex’s posts here. We wish you all the best Alex! Animation of the digital map from 1903 to 2015. Thanks to the unending patience and generosity of Russ White, Kennedy Library’s Data and GIS specialist, I learned how to use the ArcGIS mapping software to edit existing digital maps and create new ones. Fortunately, there was already a very robust digital map of campus kept up to date by the Facilities department. I worked backwards from this starting point, first finding the dates of construction for all the buildings currently standing on campus. 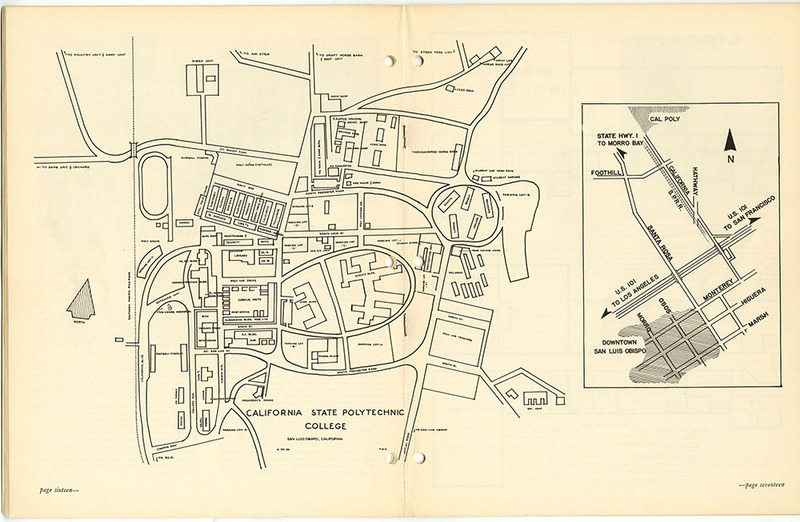 A campus map from 1956. I was in luck. Although the campus is over a hundred years old, the majority of the buildings in use today aren’t replacing much. Sure, the campus core has been overhauled a few times, but a lot of the housing and agricultural buildings took the place of fields. 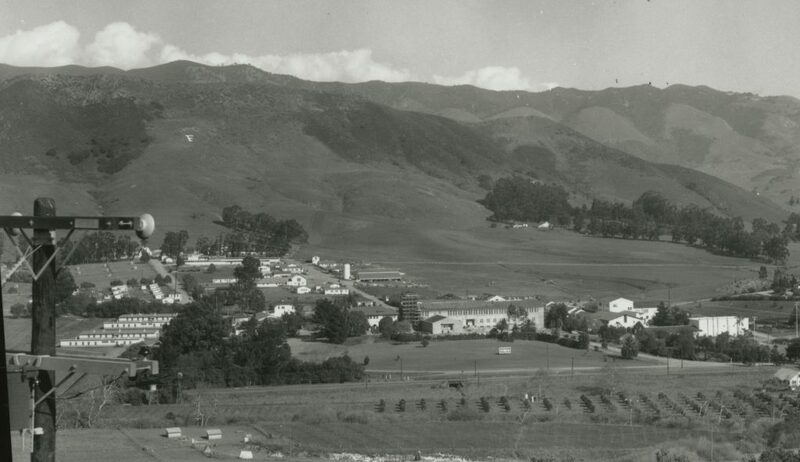 Left: The agricultural buildings in the campus core mean this photo was taken at the very beginning of the 1950s. Right: Construction on the clock tower dates this photo to 1941. The challenge began once I had to start dealing with buildings that had been destroyed. For that, I turned to maps and photos in University Archives. I was able to check the dates on these sources with other references like administrative documents, budgets, and student newspapers. 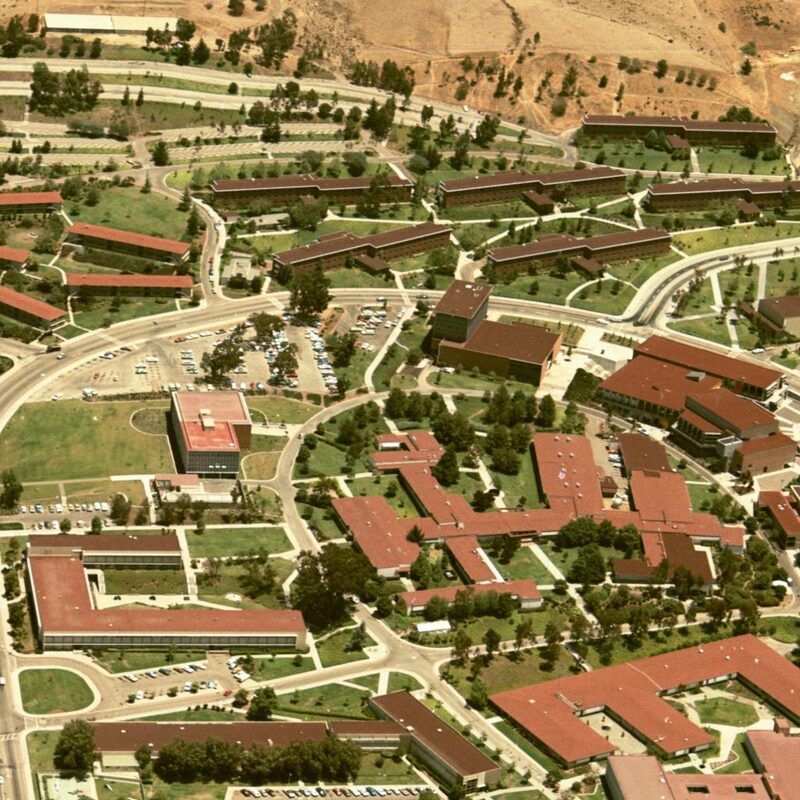 A database of all Cal Poly buildings and their construction dates began to take shape. Two photos taken within a year of one another, circa 1907. Look at the growth of the trees and the appearance of a new building behind the dormitory. Then I used the mapping software to draw the outlines of the buildings, tracing over the maps that had been published through the years. I soon realized that campus building history was very complex indeed, and I had to deal with a lot of conflicting and incomplete information. Detail from a beautiful aerial photo taken in the summer of 1972. In those days, the sprinklers were kept on all summer long. After all the research was done, however, I was able to assemble the digital map without too much fuss. The final product can be found on Cal Poly’s ArcGIS map page, or by following the direct link above. Of course, this kind of project can never really be complete. Just this year, the administration announced at least two large building plans for the next several years, and even as I write this the new housing complex is going up across from the Yosemite Residence Halls. From the beginning, I knew that other researchers should be able to expand on my work. New campus developments and new information about older buildings will always come up. All the same, I hope that my project offers a new and interactive way to experience the history of Cal Poly. 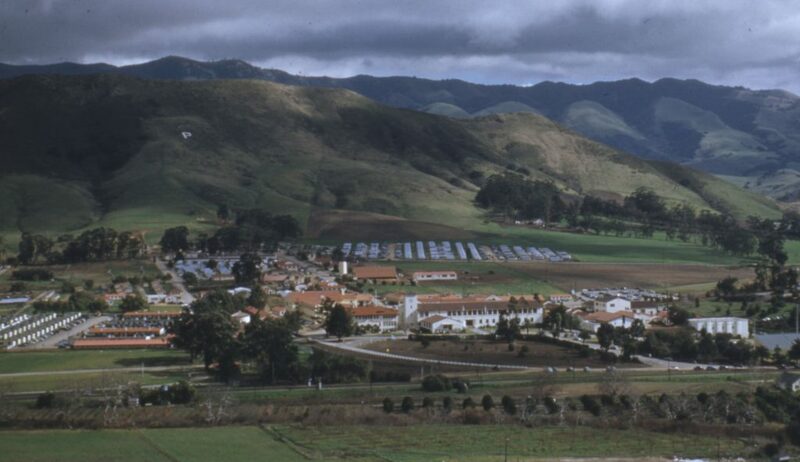 Read more on Architecture Archives, Building Cal Poly, cal poly history, special collections and archives, and university archives. Wow! Amazing work Alex. I know this will benefit many future students. Congratulations!